The Swindon Advertiser broke with tradition last week and turned book reviewer to accommodate the efforts of the Swindon Bard, James Goddard. 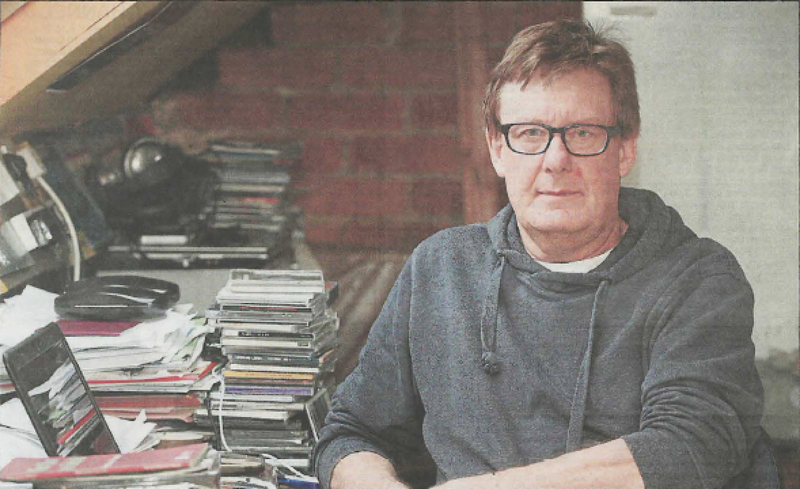 In his new role, replacing the great Andy Partridge of XTC fame who had held it for over 35 years, himself replacing the seminal Gilbert O’Sullivan, Goddard has now had reviews of his book ‘Knowledge Waits’ enshrined in the Wiltshire Bible for the foreseeable future. Here are the wise words, penned by the newspaper’s own Barrie Hudson. A New College English lecturer has fulfilled a years-long ambition by writing and publishing a novel. Jim Goddard, 60, is the author of Knowledge Waits, an uncompromising look into the lives of staff at a boys’ school. The setting and characters are fictional, but the author doesn’t shy away from viciously lampooning some of the admin-laden, inspection-driven realities of modern classroom life. “Some of the issues are real – very much so,” said Jim, who lives in Old Town and is married with two grown up children. In one passage, for example, a good teacher with an excellent record finds himself on the receiving end of a poor report from an inspector who soon reveals himself to be an idiot. Another character, a school administrator is a deluded would be BBC executive who got his job through nepotism and is scarcely articulate enough to string an error free sentence together. Other teachers in the school wrestle with grief, despair and thwarted ideals. The writing process took about 15 months, with the idea having come two or three years earlier. Knowledge Waits is Jim’s longest completed work; previously he’d finished some short stories, articles and poems. And his advice to others hoping to write a novel? “Keep writing – there’s no such thing as writer’s block. I can’t wake up and say I can’t go to work because I’ve got ‘teacher’s block’ today,” he added. With sales well into the hundreds only a few weeks after release, Jim is pleased by the book’s progress. Knowledge Waits is published by Zitebooks – www.zitebooks.com – and is available on Amazon Kindle, priced at £4.80. Barrie Hudson’s erstwhile review follows. “Knowledge Waits is easily one of the best novels by a Swindon author in recent years. Although it can be classified as a school story, this is no Goodbye Mr Chips. There is no saccharine sentimentality and barely a moment of teachers being the inspiring leaders the recruitment ads have promised they’ll become. Of the few pupils who are mentioned, one is cruelly mocked by staff because of a misshapen head. Another is mentioned in passing as having possibly had an inappropriate relationship with a member of staff, and a third is an object of contempt for demanding to have a late assignment marked. The focus is firmly on the staff, and they leap from the page not merely as human beings, but as a deftly drawn collection of personality defects and neuroses. They include an embittered near drunkard mourning the loss of the two people he cares most about in the world, a quiet man whose marriage has been rendered a hollow sham by bereavement and a failed academic facing the fact that his dreams of university stardom are forever doomed. If there Is a villain in the conventional sense of the word, It is a weasel-like school administrator obsessed with inflicting the latest trendy, but nonsensical educational theories on a the beleaguered staff. Such is the author’s skill that we end up sympathising just as much with him as we do with the teachers. The real Villain, however, is the educational system itself – or at least, the parts of it which favour box-ticking, rigid Inspections and unrealistic targets over actual teaching. One passage, in which a veteran teacher replies to a superior’s criticism of his lesson, Is particularly telling: “Many thanks for your email. Of course I always knew that I had been a complete charlatan throughout my teaching career; I am, however, surprised that it has taken the school’s management quite so long – ten years In fact – to come to the same self-evident conclusion. Knowledge Waits is plotted like a slowly boiling kettle. The author switches from one character to another, often in first person vignettes. What happens then is a catharsis of sorts, but not one likely to leave anybody better off. This book is well worth the price of admission.